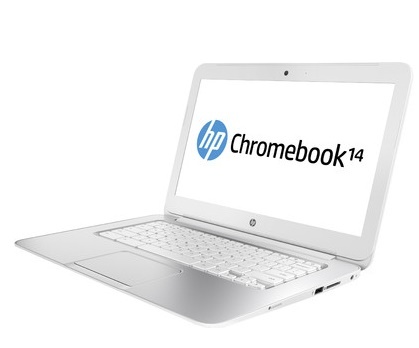 HP Chromebook 14 which comes with the Chrome OS is all set to come with Tegra K1 chip and is ready to hit the stores on 22nd October this year. With the Tegra K1 powered Chromebook, it can boast of an 9 hour or more battery life claims HP and it will come in four different colors namely Smoke Silver, Sorbet Orange, Ocean Turquoise and Neon Green. The Chromebook 14 will be priced at $300 base price initially. It was originally powered by 1.4 GHz dual core Intel Celeron with Intel HD Graphics. The other specifications of the notebook will be the same as it was. It comes with a 14-inch display with 2 GB DDR3 RAM and resolution of 1366 X 768 pixels. It has got two USB 3.0 ports and one USB 2.0 port and comes with 802.11 a/b/g/n Wi-fi and Bluetooth 4.0. It has also got an HDMI port for external display and dual stereo speakers. The Webcam is a TrueVision HD with a resolution of 720 pixels. The entire unit weighs a more than 4 pounds. Additionally, Google has provided 100 GB of cloud storage free for two years.